Okay, one more Shazam! post…. § March 30th, 2005 § Filed under big red cheese Comments Off on Okay, one more Shazam! post…. I did appreciate the apparent effort in making the newer Mr. Mind still look sorta “cute” and amusing, while addressing the modern audience’s need for something a bit more “realistic” looking. Yes, I realize I’m talking about a “realistic”-looking telepathic alien worm. Quit staring at me like that. To follow up on this morning’s post…I hadn’t forgotten about Captain Marvel’s appearances in JSA , where commenter Zack points out that he’d been having a romance, of sorts, with Stargirl. 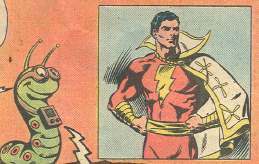 Well, actually, the much younger Billy Batson had been, but the much older looking Captain Marvel making eyes with the teenage Stargirl caught the attention of Jay Garrick, the Golden Age Flash, thus causing some minor (so to speak) problems. That was a really weird, but oddly logical, plot point to be addressed, I thought. It was sort of interesting to see it brought up, but we’re probably better off now that Cap seems to be out of the JSA book, putting that plotline to rest. 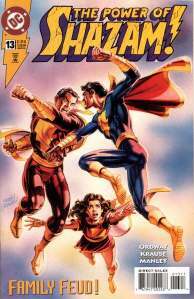 Commenter Rob points out that great DC Comics Presents annual featuring Cap and Superman vs. a super-powered Sivana, drawn by Gil Kane in his usual dynamic style. The script was by Joey Cavalieri…his dialogue never really worked for me in any of his comics work, unfortunately, but the real star of this show was Kane’s action-packed artwork. Okay, tomorrow morning…no Shazam! talk, I promise. § March 30th, 2005 § Filed under big red cheese Comments Off on More Shazam! talk. Rereading Power of Shazam , and following along with the comments sections for my previous posts, has got me considering DC’s previous publishing attempts with the Big Red Cheese. Well, there’s the Captain Marvel “tryout” in Superman #276, featuring “Captain Thunder” – but I found this great article about it and I don’t really know what to add. Then there was the 1970s series…DC’s highly anticipated Shazam! title, notable for the amount of “speculation” and “investment” in the first issue which didn’t pan out. In fact, it wasn’t until relatively recently that the early issues of this series started getting pulled out of quarter boxes and given premium prices. One of the ironies here is that due to years of it being treated as an overprinted “junk” comic, I don’t see many Shazam! #1s in nice condition…thus making near mint copies worth a pretty good chunk of change! …but overall it was a light, fun read. Even better, a good number of issues had back-up stories reprinting some of the classic Marvel Family stories from the ’40s and ’50s. If you can get your hands on any of the 100 Page Giants in this series (and there are quite a few of them), do so, as they’re chock-full of classic Captain Marvel reprints. Near the end of the run of this series, the “old-fashioned” aspect of the series made way for a grittier, more “realistic” art style, provided by Alan Weiss…though Billy was still drawn with the simpler Beck-ish facial features. This “realistic” version tried to turn Captain Marvel into your standard issue superhero with standard issue superhero problems (as evidenced by the above image from the cover of #34), but it didn’t really gel, and the series was cancelled with #35. E. Nelson Bridwell and Don Newton’s run on the Captain Marvel character in late ’70s/early ’80s issues of World’s Finest was, in my opinion, probably the best melding of the old-style whimsical Fawcett stories and the more modern comic sensibilites. Newton had an appealling cartoonish style, and Bridwell wrote some fairly uncomplicated and enjoyable stories. After the series left World’s Finest , Newton’s work on Captain Marvel would continue in new stories for the Adventure Comics digest…that printing size is hard on eyes as aged as my own, but still worth seeking out. In fact, even though I know there’s absolutely no chance of this happening ever, it’d be nice to see a reprinting of Newton’s work on the character. Outside of these series, Captain Marvel popped up here and there there. There was that Superman vs. Shazam treasury edition (in which Captain Marvel refers to a mode of attack that eventually gets used in Kingdom Come …noted, if I may toot my own horn, by yours truly in the Kingdom Come annotations, under “page 16”). One of my favorites as a young Mikester was this two part story in DC Comics Presents , teaming Supes and the Captain against the meeting of the Misters, Mind and Mxyzptlk. He got involved in a JLA/JSA crossover, he puts in an appearance in All-Star Squadron , he cameoed in Crisis …but he didn’t really become a regular part of the DC Universe again until the Legends mini-series, where he played a major part. That of course spun-off the Giffen-era Justice League series, where the character was maybe played a little too much as a goody-two-shoes…though in the context of the “sitcom” feel of this particular series, it worked well enough. It was certainly a darn sight better than the other spin-off from the Legends : this ghastly thing, which I mentioned yesterday. And of course that brings us up to the Power of Shazam! graphic novel by Jerry Ordway, which shares with the spin-off series of the same name the qualities of beautiful art and somewhat clunky dialogue. It’s still a nicely done book, and I appreciate the conceits of 1) Billy’s dad being named after C.C. Beck, and 2) that Billy’s dad is also the spitting image of Captain Marvel. Nowadays Captain Marvel is a more integral part of the DC Universe…he’s teamed up with Superman several times (with another highly-publicized teaming in the near future), he was a central part of the Underworld crossover as well as the aforementioned Kingdom Come , and he was one of the more touching elements in Frank Miller’s much-maligned Dark Knight Strikes Again . And, of course, there’s the much-anticipated Jeff Smith mini-series. Plus, don’t forget his forthcoming appearance in the Justice League Unlimited cartoon. Okay, I think that’s driven most of the Captain Marvel talk out of my system. Thanks for coming along…and thanks especially for the interesting discussions in my comments sections. I particularly liked commenter Cole’s points regarding the place of Captain Marvel’s wish fulfillment fantasy in regards to modern comic book fans. More about this Shazam stuff. § March 29th, 2005 § Filed under big red cheese Comments Off on More about this Shazam stuff. I did appreciate that with this revamp of Captain Marvel, work that had been done with the character in the then-recent past hadn’t been ignored. For example, Cap’s stint with the Giffen-era Justice League is referenced, even though it predated this revamp by about five years or so. I forgot that Gil Kane also contributed artwork to a couple issues, adding to the spectacular illustration jobs that was the hallmark of this series. The stories are pretty standard, focusing on Captain Marvel Jr., but it all looks so purty you really don’t mind. One of the things that really annoyed me about the series was the characterization of Ibis, whose dialogue was peppered with frequent sighs to demonstrate how bored and jaded he is with the world. Granted, it was annoying to the characters within the story as well, but it was pretty aggravating to have to read. An element of the series that had slipped my mind was the old wizard Shazam leaving the Rock of Eternity to live with Billy Batson as his “grandfather.” Yes, it’s the old chestnut of someone high and mighty having to adjust to living with the common folk, but it generally works amusingly in this context. Just recently, pal Dorian and I were talking about Thunder, the future Marvel Family member, and how we’re probably never going to see her again given her ties to one of the many previous revamps of Legion of Super-Heroes continuity. Too bad…this was a fun character (with the nice twist of the wizard Shazam’s position being taken by the aged Billy Batson version of Captain Marvel). For my mostly minor problems with the series, it’s about a thousand times better than this thing. I normally love Roy Thomas’ work, and I normally love Tom Mandrake’s work…but this version of Captain Marvel was a carwreck. 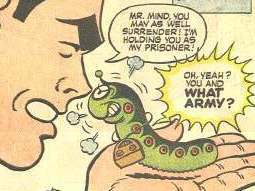 The series ends with Sivana in some bar drinking straight from a bottle of Tequila…and the worm at the bottom of the bottle was, you guessed it, Mr. Mind. What the…?!? Some custom Legion of Super-Heroes figures, including the aforementioned Thunder. Who you callin’ a dip? § March 28th, 2005 § Filed under big red cheese, from the vast Mikester comic archives Comments Off on Who you callin’ a dip? One of the recent titles I poured through recently, as the scan might hint, was Walt Simonson’s run on Orion . Coming on the heels of the previous Jack Kirby’s Fourth World , presumably the powers that be at DC Comics thought a title focusing on one character rather than an all-encompassing New Gods might catch on more than previous attempts with this particular batch of Jack Kirby’s characters. 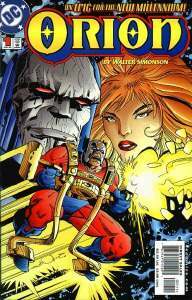 Simonson is one of the few cartoonists to really “get” the Fourth World, and this title was filled with his usual fast-paced action and wackiness, on top of the inherent nuttiness of Kirby’s creations. Next on the reread list is Power of Shazam , which was a gorgeous-looking book, with Peter Krause and Mike Manley on art chores at first, and Jerry Ordway (who painted the wonderful covers for the whole run) finishing up on the interiors at the end of the run. The late Curt Swan popped in for a guest-penciller appearance once or twice as well. Ordway also provided the scripts, which…well, seemed a little rough around the edges sometimes. The dialogue was a little wonky, and stories seemed to end when the book ran out of pages, rather than build to any kind of conclusion. 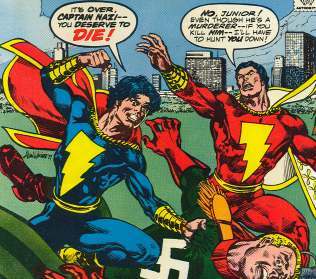 Despite my minor qualms, my memories of the book are that it was a fun and enjoyable title, walking that fine line between the whimsy of the original Captain Marvel stories of the ’40s and ’50s and the tastes of modern comic fans. Ordway even managed to work in Hoppy the Marvel Bunny and come up with a new origin for Mr. Tawky Tawny! Besides, any comic where you can send away for a decoder card can’t be all bad! One oddity from the series that I was reminded of last night, as I read the first couple of issues, was that the teacher from Calvin & Hobbes , Mrs. Wormwood, is also Billy Batson’s teacher…now there’s an odd in-joke. Here’s an old article I came across about superhero movies (it mentions the possibility of the forthcoming Hellboy movie, for example). Of interest is a list of “best” and “worst” super-movies… Swamp Thing is on the “Worst” list, naturally, and apparently some kind of typo put Batman Returns on the “Best” list. Also of note is a sidebar regarding the troubled attempts at a Fantastic Four movie.